Dovetailing Tip: Use up the leftover cooked vegetables and bacon from the week. In a large frying pan melt the butter, make sure it doesn't brown. Add the finely chopped onion and fry gently for about 3 mins or until soft and translucent. 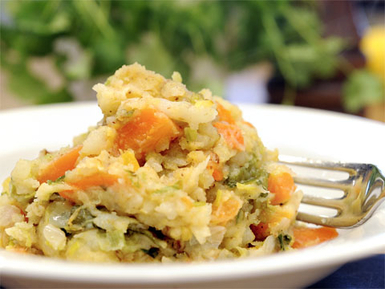 Turn the heat up ever so slightly and add the mashed potato and all of the chopped up leftover vegetables. Fry for at last 10 minutes turning them over continuously in the melted butter ensuring the potato and vegetables are thoroughly reheated. Plus you are also aiming to brown the outside edges of the vegetables but not to burning the bubble and squeak, so occasionally press the mixture onto the pan to brown a little then continue stirring. Finally, when the mixture is heated right through, do one long final press. Press the potato mixture on to the base of the pan with a spatula and leave to cook for 1 min. Flip over and repeat. Serve as is, or with either a fried or poached egg on top, the bacon pieces, or any leftover roast reheated thoroughly. An alternative is to mix the potato and vegetables and form into small patties then fry as above.